For over a decade, the »Mini Paddle« has proven to be highly reliable portable dual paddle for Morse code and CW, and many operators have wished for a single-lever version. Well, here it is! Like all Palm paddles the »Palm Single« is also equipped with electroplated gold contacts that ensure maximum contact safety and reliability. 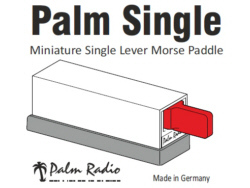 For maximum protection during transport and storage, the Palm Single Paddle can be retracted into itss robust housing (extruded, powder-coated aluminum or black ABS, just as known from all Palm Radio keys. The lever of the »Palm Single« features a clever mechanism which automatically centers it in the middle position - no adjustments to be made! Another feature is that you can select either the normal »single paddle mode« or the »sideswiper mode«. The switching between these modes is done directly at the lever by use of the supplied hex key, which is also used for the adjustment of the set screws. 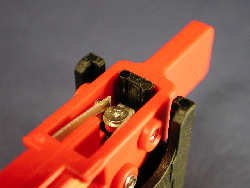 The hex key can be stored in the base plate of the key (»QuickMount«) - perfectly placed and always at hand. Two different set screws on each side of the lever allow precise and individual adjustment of the contact gap and the spring pressure. 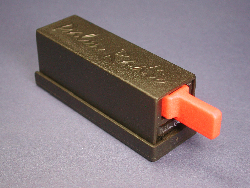 Hard, defined stop of the paddle lever. 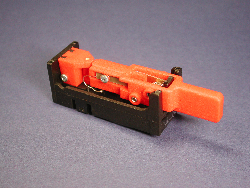 Automatic centering of the lever- no manual adjustments required. Paddle pressure per side individually adjustable from approximately 2 to 40 grams. Easily selectable between single paddle and side swiper (CootieKey) mode. complete key 48g (aluminum housing) or 30g (ABS housing). Paddle lever can be retracted for transport and is therefore best protected. Dimensions: 25 x 25 x 79 mm = 1 x 1 x 3.1 inch. Supplied: Manual, QuickMount (universal mount plate with magnets) and Palm Radio connection cable (with PalmPlug connector). Click the images to view in full size.